Unlike profiles, the sell access settings for groups is only accessible under the "Manage" menu. This feature allows your group administrators to sell membership to their BuddyPress groups. You can select to enable this feature by default for all groups or let group admins choose to use this feature. 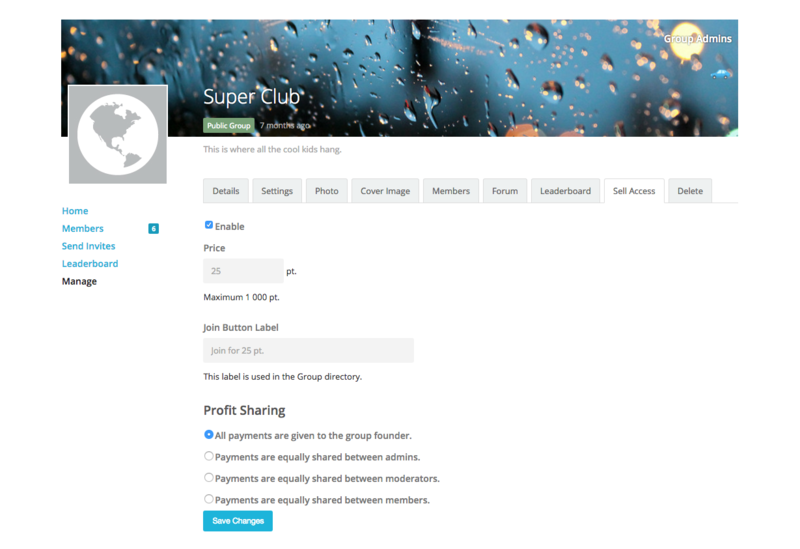 Besides charging for membership, you can also select if you want to share the profit amongst group members / admins / mods. For private groups, the plugin will hide invites from users that can not afford to pay. First, we need to set the language we want to use in the Group Menus. You can also select to move the menu around by changing the priority. The higher the priority, the further the menu is moved towards the end of the menu list. Next, we need to decide if we want to enforce this feature on all groups by default, or if we want the admins to decide if they want to use it. Either way, we need to select the point type we want to use as payment (if you have more than one setup), set the default price, set a price limit and finally choose if we want to charge a “fee” for each sale. This fee is taken out of the amount the user paid, before the amount is deposited to the group admin / mod / users. Non Member Template Used when the group is viewed by someone that is not logged in on your website. Sale Template Used when a access can be purchased by the current user. Insufficient Funds Template Used when the user viewing the group can not afford to pay the price to join. Before you save, make sure the Log templates used for payments and payouts are not empty! This is what users will see when they view their history.